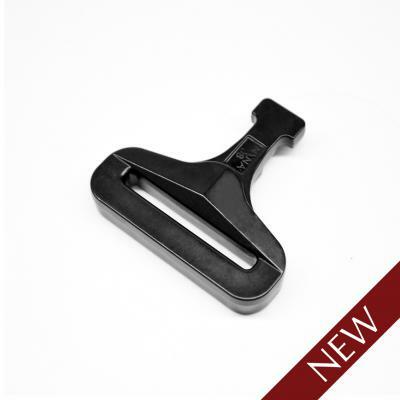 ITW Nexus North America is proud to partner with AustriAlpin™ and introduce a new game changer to the hardware industry, the GT Cobra™ high strength polymer buckle system. Collaborating with the leader in load bearing hardware, ITW Nexus™ and AustriAlpin™ have teamed up to introduce an all-polymer Cobra™ buckle utilizing AustriAlpin's existing load bearing hardware technology and incorporating ITW Nexus' manufacturing and polymer product design and development expertise. Designed to be more robust than any other type of plastic hardware on the market, with a targeted tensile load of 500lbf, the GT Cobra™ buckle is a 100% Polymer system with no metal components. A few of the many GT Cobra™ advantages include its lightweight construction, noise discipline, Infra-red reduction compliance, cost to performance ratio, and 100% U.S. Berry Amendment compliance for Government applications. The GT Cobra™ buckle will be offered in three sizes: 1.5”, 1.75”, 2.0” [38mm, 44mm, 50mm], other sizes by special request based on applications. The GT Cobra™ buckle is designed for all heavy duty load bearing applications such as belt systems, pet collars and leashes, plate/armor carriers, shoulder straps, patient mobility devices, tie down harnesses, PFD’s, backpack systems, medical litters, transportation and seating systems, as well as any other applications that demand high performance for your complete product life cycle.